Picture - The Josephine Ford at The Henry Ford. 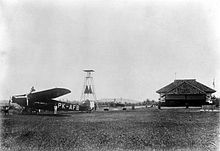 The Fokker F.VII was an airliner produced in the 1920s by the Dutch aircraft manufacturer Fokker, Fokker's American subsidiary Atlantic Aircraft Corporation, and other companies under licence. The original Walter Rethel design of 1924 was a single-engined high-winged monoplane. Anthony Fokker modified the design with two additional engines to enter the inaugural Ford Reliability Tour in 1925, which it won. Consequently, the production versions F.VIIa/3m, F.VIIb/3m and F.10 all had three engines, and the aircraft became popularly known as the Fokker Trimotor. Picture - The Southern Cross in 1943. The 8- to 12-passenger Fokker was the aircraft of choice for many early airlines, both in Europe and the Americas. Along with the similar Ford Trimotor, itself having an all-metal design based on the World War I aircraft designs of German engineer Hugo Junkers, it dominated the American market in the late 1920s. However, the popularity of the Fokker quickly came to an end after the 1931 death of Notre Dame football coach Knute Rockne in the crash of TWA Flight 599, a Fokker F.10. The subsequent investigation, which revealed problems with the Fokker's plywood-laminate construction, resulted in the banning of the aircraft on commercial flights, and the rise of all-metal aircraft such as the Boeing 247 and Douglas DC-2. Richard E. Byrd claimed to have flown over the North Pole in the Fokker F.VIIa/3m Josephine Ford on May 9, 1926, a few days before Roald Amundsen accomplished the feat in the airship Norge. Two lieutenants of the United States Army Air Corps, Lester Maitland and Albert Hegenberger, made the first flight from the continental United States to Hawaii (c. 2,400 mi/3,862 km) in the Fokker C-2 Bird of Paradise in June 1927. That same month, Richard E. Byrd, Bernt Balchen and two others flew the first official trans-Atlantic airmail in the C-2 America, crash-landing off the coast of France. 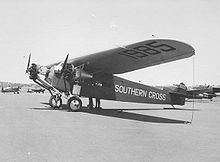 Sir Charles Kingsford Smith's F.VIIb/3m Southern Cross was the first aircraft to cross the Pacific from the United States to Australia in June 1928, and the first to cross the Tasman Sea, flying from Australia to New Zealand and back in September of that year. Lieutenant Colonel 'Dan' Minchin, Captain Leslie Hamilton and Princess Loewenstein-Wertheim attempted to become the first aviators to cross the Atlantic from east to west using a Fokker F.VIIa named the St. Raphael on August 31, 1927. Their fate remains unknown. Amelia Earhart became the first woman to fly across the Atlantic on 17 June 1928, as a passenger aboard the Fokker F.VIIb/3m Friendship. A group of U. S. Army Air Corps flyers, led by then-Major Carl Spaatz, set an endurance record of over 150 hours with the Question Mark, a Fokker C-2A over Los Angeles on 1 to 7 January 1929. The purpose of this mission was to set a flight endurance record using aerial refueling. Single-engined transport aircraft, powered by a 360 hp (268.5 kW) Rolls-Royce Eagle piston engine, accommodation for two crew and six passengers; five built. Single-engined transport aircraft, slightly larger than F.VII with new undercarriage and wing. Flown on 12 March 1925. First aircraft had 420 hp (310 kW) V-12 Packard Liberty engine but remaining 39 F.VIIa had mostly radial Bristol Jupiter or Pratt Whitney Wasp engines. Version with two additional underwing engines, flown on 4 September 1925. The first two aircraft were identical to the F.VIIa. From the third aircraft, the fuselage was 31 in (80 cm) longer and was powered by with 200 hp (149 kW) Wright J-4 Whirlwind radial engines. Probably only 18 were built while many F.VIIas were upgraded to the F.VIIa/3m standard. First two Fokker F.VIIAs were converted into three-engined transport aircraft. Main production version with greater span, 154 built including built under licence. American built version of the Fokker F.VIIB-3m, built by the Atlantic Aircraft Corporation in the United States. Enlarged version of the Fokker F.VII airliner, able to carry up to 12 passengers. Built by the Atlantic Aircraft Corporation in the United States. Military transport version of the Fokker F.9, powered by three 220 hp (164 kW) Wright J-5 radial piston engines, accommodation for two pilots and 10 passengers; three built for the US Army Air Corps. Military transport version for the US Army Air Corps, with greater wingspan, powered by three 220 hp (164 kW) Wright J-5 radial piston engines, accommodation for two pilots and 10 passengers; eight built. One C-2A fitted with three 330 hp (246 kW) Wright J-6-9 radial piston engines. Redesignated C-7 when four C-2A sisters were similarly reconfigured. Military transport conversion of C-2A for the US Army Air Corps by re-engining with 300 hp (220 kW) Wright R-975 engines. XC-7 prototype and four C-2As redesignated in 1931. Six new production C-7 (Wright R-975) aircraft with larger wings, new vertical fin design, and fuselages patterned after the commercial F.10A. Experimental light bomber version of the C-7, powered by three 410 hp (306 kW) Pratt &amp; Whitney R-1380 radial piston engines; one built. Military transport version of the US Navy and Marine Corps; three built. Military transport version for the US Navy; three built. Military transport version for the US Navy, powered by three Wright J-6 radial piston engines; one built. Three aircraft built in Italy as the IMAM Ro.10. Plage i Laśkiewicz. Between 1929 and 1930 11 passenger and 20 domestically developed (by Jerzy Rudlicki) bomber aircraft. Three aircraft built in Spain. Avro, 14 aircraft known as Avro 618 Ten. Det Danske Luftfartselskab operated three F.VIIa aircraft. CIDNA operated seven F.VIIa aircraft. STAR operated one F.VIIa aircraft. Malert operated two F.VIIa aircraft. KLM received all five F.VII aircraft and 15 F.VIIas. 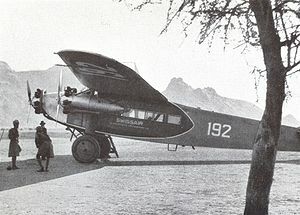 Aero operated six F.VIIa aircraft for a short period in 1928. Since 1 January 1929 all aircraft were handed over to PLL LOT airline. Polskie Linie Lotnicze LOT operated six F.VIIas and 13 F.VIIb/3ms between 1929 and 1939. Aero Portuguesa operated one F.VIIb-3m aircraft. Swissair operated one F.VIIa and eight F.VIIb-3m aircraft. American Airways, which later became American Airlines. Pan Am operated F.VIIb/3ms aircraft. Finnish Air Force operated one F.VIIa. Royal Netherlands Air Force received three bomber F.VIIa/3m aircraft. Polish Air Force operated 21 F.VIIb/3m (20 of them were licence-built) aircraft as bombers and transports between 1929 and 1939. Spanish Republican Air Force, operated seven aircraft. United States Army Air Corps designations include Atlantic-Fokker C-2, C-5 and C-7. Bowers, Peter and Ernest McDowell. Triplanes: A Pictorial History of the World's Triplanes and Multiplanes. Osceola, WI: Motorbooks International, 1993. ISBN 0-87938-614-2. Postma, Thijs. Fokker: Aircraft Builders to the World. London: Jane's, 1979. ISBN 0-531-03708-0.